Cover for cooling drink bottles under the blazing sun 10 °C lower than the ambient temperature: This is a patent for a cooling sheet for blocking sunlight and eliminating heat through vaporization. 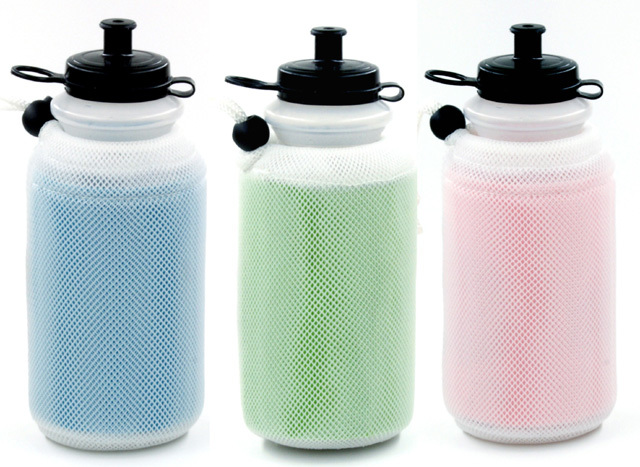 It has been sold as a drink bottle cover used with bicycles. 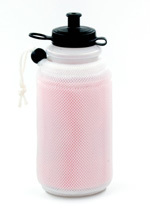 Always be able to drink cold water even in hot weather Cooling bottle cover. 1. Sunlight is shielded by a light shielding / aeration layer on the surface. 2. 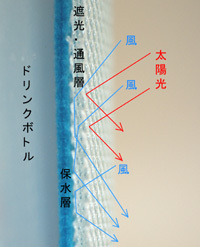 The wind passes through the light-shielding / aeration layer and evaporates the water of the water retention layer. 3. Water evaporates in the shade and cools the bottle. When stopping the ordinary bottle was further raised to 38 ° C. The person who attached the cover maintained 26 ℃. This temperature difference is the difference between drinking hot water and drinking water. The water soaked in the cover evaporates gradually. Please hold water once at about break every 2 hours. Since there is a knit fabric on the outer periphery of the cover, it will not get very wet even if you hold it with your hand. 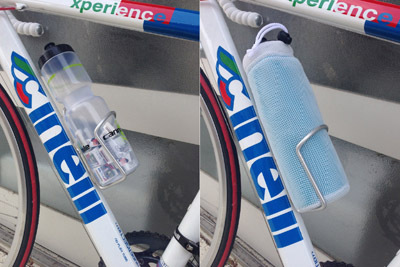 The reason I thought about developing this bottle cover is when I played in 400 of the 2012 Tour de France. It is a competition that will run 400 km in 3 days. The maximum temperature continued from 36 to 37 ° C for three days. Even if you put ice and water in a drink bottle, it looks like hot water in a bath soon and there is no refreshing feeling even if you drink it. I would like to drink a cold thing but the vending machines on the course are few and few vending machines are easy to stop Vending machines are sold out. At that time, I wanted to make a cover that constantly cools the inside of the bottle by taking the heat of vaporization. I think that it will cool even if you wrap a wet towel, but it evaporated quickly and the effect did not last long and I thought that the direct sunlight did not get cold enough as I expected. 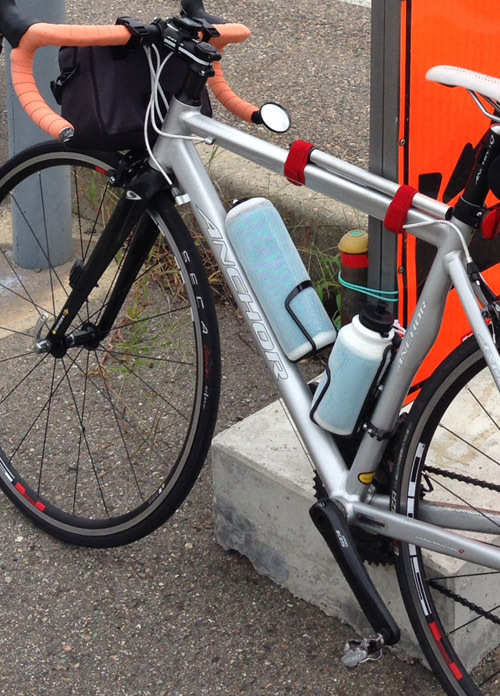 So I thought about a method to efficiently deprive the evaporation heat through the windshield with the water retention layer in the shade and it is a motorcycle bottle cover. While running, please cover the cover with water for about 2 hours. Then the cooling effect will continue semipermanently. In practical long distance traveling, I rest at that interval, so please wet the cover with water at that time. Please let me cover the water with water. 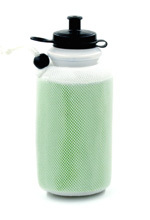 Please put a drink in the drink bottle before running and let the bottle cover infiltrate the water. This is the only preparation. Please insert into the bottle gauge and run. The thickness of the cover fabric is about 2 mm. Although it may be difficult to go into a gauge a bit, I think that it will fit if it is resilient to a bottle or gauge and strongly inserted. I tried carrying chocolate on a day when the temperature was 30 ° C. After traveling about 25 km the bottle temperature was in the 10 ° C range. For long-distance driving, it is also possible to add supplementary meals such as rice balls. If one of the two bottles of long bottles is supplemented, you can run safely even at a convenience store with fewer convenience stores. 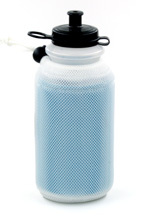 During running, the water of the bottle cover gradually evaporates and it cools the inside. Please let me cover the cover with water at break. I think that it is good at about once every 1 to 2 hours. Note: The product photo is the same for short and long use. Actual product is length suitable for bottle.